During the warm spring, summer and fall months, we recommend a bathing suit, board shorts, yoga pants and/or a rash guard or shirt. Synthetic materials are recommended as they could get wet. Please come already lathered in sunscreen and dressed in your paddling clothes. Most people are surprised how warm they get! If the weather forecast looks a bit chilly or you are particularly sensitive to cold, you may want a wetsuit. If you don’t already have one, they are available for rent and we’re happy to reserve one for you. Please email us with your size or height/weight at least 2 days in advance. Footwear: Most people paddle barefoot and are fine. If you have a pair of water booties, they can be used, but are generally not required. There is no secure storage, so please leave your expensive items at home. The quaint village of Capitola, CA is located just minutes south of Santa Cruz, CA and right “over-the-hill” from San Jose, CA. We meet at Capitola Beach, at the entrance to the sand, near the Capitola Beach Company surfboard and SUP rental trailer, at the far end of the Esplanade. The closest physical address is: Britannia Arms, 110 Monterey Avenue, Capitola, CA 95010. From San Jose, on an early Sunday morning, 45min is the typical drive time.. Take Hwy 880/17 South towards Santa Cruz. Exit Bay Ave. towards Porter St. Turn R onto Bay Ave. Slight R onto Monterey Ave. In 200ft on right, you will see Capitola Parking sign right before you reach Park Ave.
You can Google Maps this location: Monterey Ave at Park Ave, Capitola, CA. There are two parking lots located behind City Hall/Police Station on Capitola Avenue, just a short walk down the hill to the Village. The cost of meters is $0.50/hr. with 12 hour time limit. The meters run from 8:00 a.m. to 8 p.m. 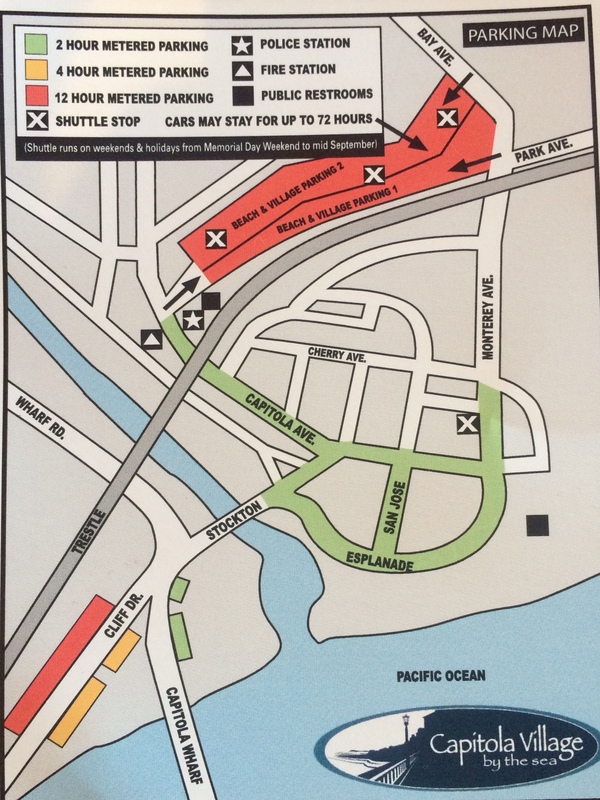 There is also parking closer to beach at $1.50/hr., but avoid using this option because max parking time is 2 hours. Some meters only accept quarters, so don’t forget to bring some! Not only is it ok to bring your own board, you can also get $15.00 off the cost of a weekly class! Just contact us, and we’ll give you a discount code to use when you register. Children are naturals on the paddle boards. They have a great time especially as they find it easier to balance than their parents! Every one under the age of 18 needs a parent or guardian to sign for them, they must wear a PFD (included) and one adult per child, either on the board itself or supervised by an adult on a SUP within close proximity. Typically children 12 and older are welcome to join in the weekly group class. Children under 12 years old may need more assistance, so we recommend a private class so that the instructors can personally assist them. Everyone, regardless of age, should know how to swim and be comfortable being in the ocean. Full refund if event is cancelled due to weather, wave conditions or if cancelled by organizer. Full refund if cancellation requested in writing prior to 1 week before event. Class Packages are available for 3 classes or 5 classes. These pre-purchased classes are also transferrable so you can share the love. Feel free to contact us to purchase your class package. SUNDAY MORNINGS DON’T WORK FOR YOU? Please contact us to arrange a private lesson or a special class for you and your friends. No problem, we’ll happily discuss all your questions. Just contact us.